In the beginning of the Lord Buddha period. Buddhism was widely prevalent in Rajagaha City. The monks who were living there had to take care of themselves when they were sick. They sometimes got some medicines from their relatives or from the people who expressed willing to provide the medicines for the monks in advance. There were no conveniences at all for the monks in those days. When Ven. Dr. Jivaka Komarabhacca had graduated from Taxila. 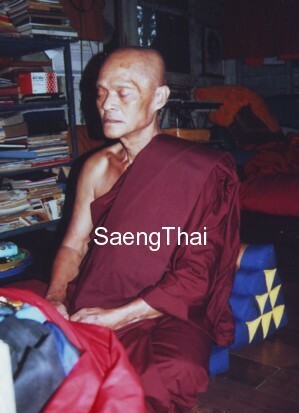 He surrendered himself to be a public doctor and he provided the medical services for the Lord Buddha, the sick monks. All the medical conveniences and more comfortable treatment were provided by Jivaka Komarabhacca. Ven. Dr. Jivaka Kormarabhacca satisfied the King Bimbisara so that he was appointed by the king to be a doctor for Royal family. He also gave the treatment to King’s internal subordinates. Apart from this, Ven. Dr. gave the neuro-surgery for brain symptoms to the millionaire of Rajagaha City and the abdominal operation for Varanasi millionair’s son. This indicated that the medical treatment which Jivaka Komarabhacca used in those days, was very advanced like the present treatment has been. Apart from the medical treatment, Ven. Dr. Jivaka Komarabhacca had also played a key role in improving the monks’ living standard e.g. he approached to the Lord Buddha and informed the Lord Buddha to give an allowance of walking up and down-seat and fire-house to the monks. And previously the monks faced the difficulties in searching for the clothes, he requested the Lord Buddha to give an allowance of the clothes. That is to say, the monks could directly received the clothes provided by the house-holders. As a result of this, the monks lived the more comfortable life up to the present. Ven. Dr. Jivaka Komarabhacca also felt care about the social condemnation of meat-eating of the monks. He asked for suggestion from the Lord Buddha on how to do about meat-eating. The Lord Buddha laid down the regulation for this case that the monks were allowed to eat the meat sold publicly in the market, but not to eat the meat prepared specifically for them. Ven. Dr. was not only the greatest doctor in the Buddhist era but also a good man who had the oblinging, requitaliting for the done favours, mindful equipped with wisdom and energy. He had the responsibility to all his patients and the society. The individual conduct and role of Ven. Dr. Jivaka Komarabhacca pertaining to giving many services to Buddhism e.g. medical service, clothes service etc. became the good direction which the monks and lay disciples in later generation has followed up to the present. At the time of the Buddha, among the lay physicians, the most renowned was Ven. 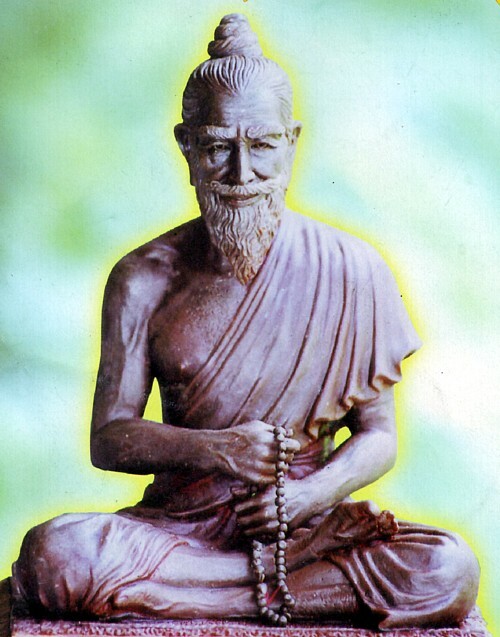 Dr. Jivaka Komarabhacca, who is described as providing free medical care to the Buddha and other monks and donating his mango grove at Rajagaha for use as a monastic community, named Jivaka Ambhava. Jivaka’s fame as a healer was widely known and tales about his life and medical feats can be found in almost all versions of Buddhist scriptures. A courtesan of Rajagaha named Salavati, gave birth to a son whom was then given to a slave woman, who placed him in a winnowing basket, which was thrown on a rubbish heap. The infant is taken and raised by the king’s son Abhaya.The boy is given the name Jivaka because he was alive (from root jiv, to live), and because a prince cared for him he is called Komarabhacca (nourished by a prince). Jivaka, as he approached the age at which he must seek his own livelihood, decided to learn the art of healing. Hearing about a world-famousÂ healer in Taxila, he traveled to that city, famous for education, to apprentice with the eminent doctor. After seven years of medical study;To test his knowledge, his teacher asked him to go all round Taxila to search for any plant which was not medicinal and bring it back. Jivaka proved to be so proficient in medicinal plants that he returned after a long search and declared that he had not seen any plant that was not medicinal within a yojana (13 km) of Taxila. Returning to Rajgir, he cured many people suffering from serious ailments and even performed surgery, something unheard of in those days. He became the leading physician and surgeon of Rajgir and earned great wealth through his medical practice. At some point in his career, he became a lay disciple and used to attend on the Buddha three times a day. When the Buddhaâ€™s foot was injured by a splinter from a rock hurled by Devadatta, it was Jivaka who attended on him and healed the wound. Realizing the advantages of having a monastery near his home, Jivaka built one on his extensive mango garden called Jivaka Ambhava. It is situated between the city’s East Gate and Gijjhakuta, and the site has been identified a short distance from the foot of Gijjhakuta, and donated it to the Buddha. The site of this monastery was excavated recently, which exposed the buried foundations of elliptical buildings, possibly of monastic nature, of an early date. The original rooplor, 100% Pong Jawassana Jindamanee ! A gold takrut, all the 99 pieces of special phim with gold takrut (see above) is with SaengThai Malaysia! What is so special about this Rooplor MoCiVo Jindamanee??? Let me share with you briefly what this article is about. The Teacher in the photo is none other than Ven. 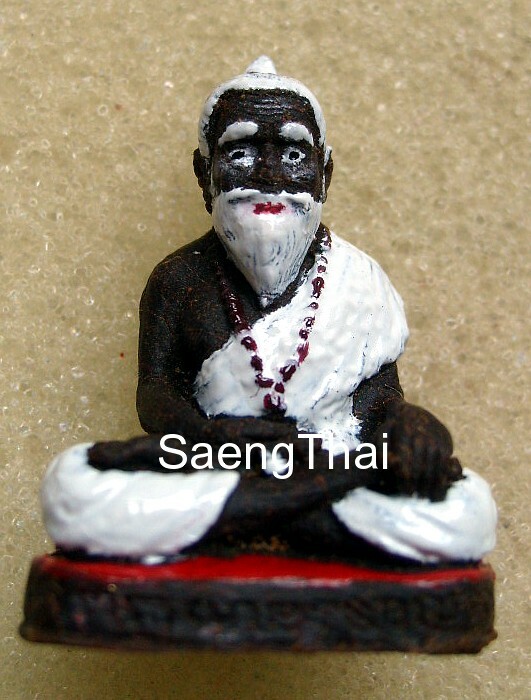 LP Perm Wat Klang Bang Kaew, disciple of the ever famous Ven. LP Boon Wat Klang Bang Kaew. He is making Pong JawassanaÂ Jindamanee in the photo. In his lifetime of practice, he made it once only. It is very difficult to explain Pong Jawassana Jindamanee. To say it is very powerful, it may seem unreal or exaggerated. To say it is very effective seems uninteresting and an understatement. May I say, it is truly out of the world . Very veryÂ few Teacher can do it 101% well. 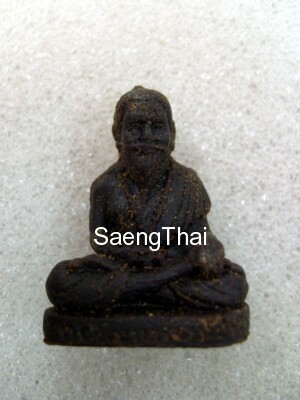 In Thai, its potency is often referred as ‘Kop Cakkawan’ means it encompass everthing in the universe. 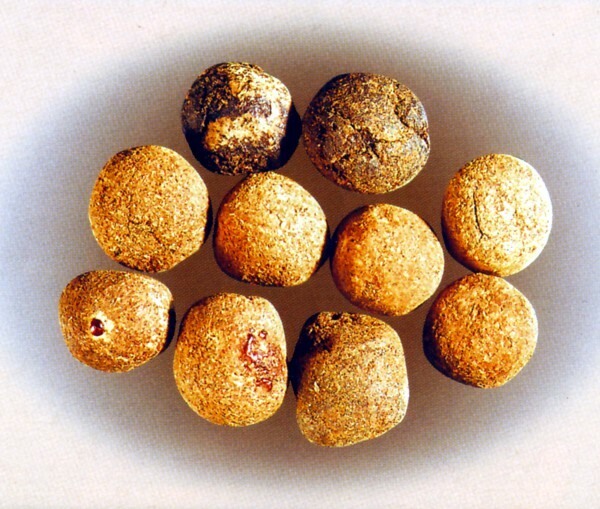 It has great healing potencies, it is said to heal everything in the universe. It enhances luck, loving-kindness, and avoiding misfortunes. How did this Pong Jawassana Jindamanee come about? 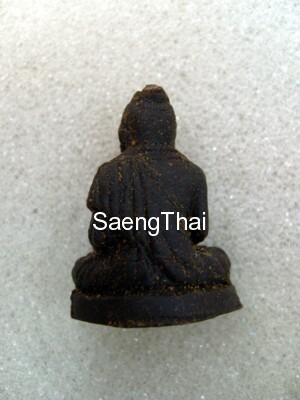 It was used, during His Majesty King Naret ( Naresuan ) in Ayuddhaya Era. 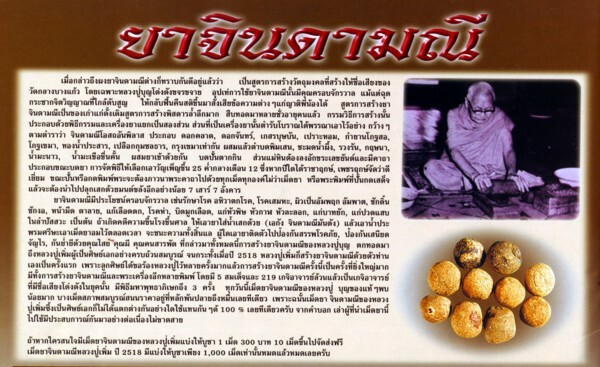 This special formula was prepared by Somdej Phra Panarat of Wat Pah Kaew. It is made for His Majesty to build his immune system so strong that he is free from all illness and empower him with all the greatness in the universe. 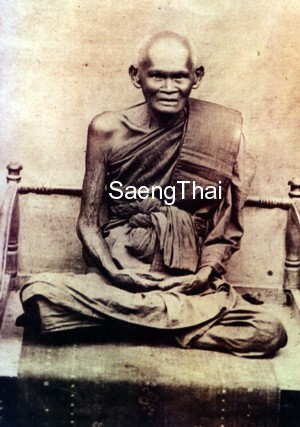 As we all know His Majesty King Naret is so strong physically and sharp mentally that he won many great wars then and declared Thai independence from Hongsawadi, Burma. Unfortunately, when Burma invaded Ayuddhaya again, they have burn down many temples and as a result may important kathas was lost. However this formula was first inherited by Ven. LP Sook Wat PakKlong, Petburi but nobody knew how did Ven. LP Boon Wat Klang Bang Kaew got this lost formula. That was why Ven. LP Boon’s amulets with Pong Jawassana Jindamanee is very high in value and in great demand. Then the formula was passed down from Ven. LP Boon to his two other disciples, Ven. LP Perm and Ven. LP Thong Yew. Both of them though hardly created much of Pong Jawassana Jindamanee. And now this formula is with Ven. LP Somyod because he is related in blood to Ven. LP Boon. What is Pong Jawassana Jindamanee? 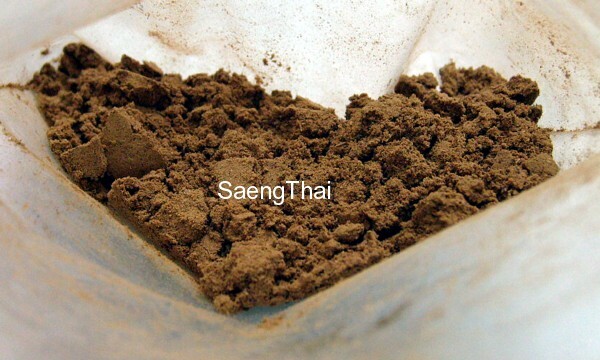 Pong Jindamanee is a combination of 30 over natural herbs and woods. It undergoes a strenuous katha incantations and Vipassana meditation during phisek ceremony until it become lively and omni potent. It has a unique aroma, Ven. LP Somyod said to us, if anyone follows the recipe strictly, its preparations and processes, it will end up with the same aroma. That is why this Rooplor MoJiWo is very uniquely scented. Perhaps now you can imagine why Ven. LP Somyod made Mo Ci Vo. Pong Jindamanee with its great potent healing properties and Mo Ci Vo with his skillful art of healing, this combination will bring unimaginable results. At the base of the rooplor, it was written ‘Arokhaya ParamaLapha’, Arokhaya means free from any illness and ParamaLapha means great luck in being healthy. Or it simply means ‘Health is Wealth’. It took Ven. LP Somyod many years before he finally collected all the combination of herbs. Ven. LP is a perfectionist, he won’t start making until he obtained all the herbs with the right quantity. Ven. LP is already very generous with his pong because most Teachers will only sprinkle some into their amulets but for this MoJiWo, it is 100% solid pong, no harderner. That is why it can be eaten when an urgent situation arises! In Thailand, there have already been many instances where Pong Cindamanee have proven its prowess. There was one time when a wealthy man was diagnosed of critical illness and the doctor told his son that his father will not last long. His son found Pong Cindamanee and fed his father regularly. His father was miraculously cured. The wealthy man then desperately tried to acquired all the Pong he can but unfortunately it is not something that can be made ready easily. Another occasion was when a woman was brought to seek Ven. 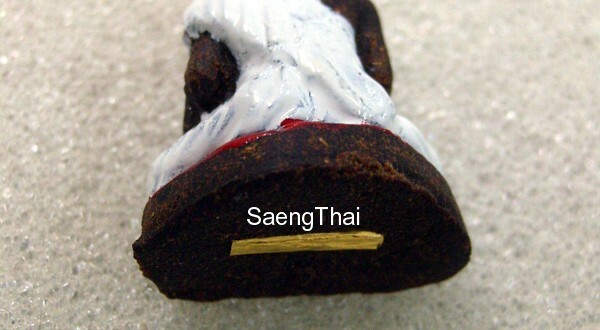 LP Thong Yew after being inflicted with dark soccerry. All Ven. LP did was prepared a drink with Pong Cindamanee for her. As a result she vommitted out the bad things in her body and was subsequently recovered. Believe it or not, it is up to you. “We invite the spirit of our Founder, the Father Doctor Shivago, who comes to us though his saintly life. Please bring to us the knowledge of all nature, that this prayer will show us the true medicine of the universe. In the name of this mantra, we respect your help and pray that through our bodies you will bring wholeness and health to the body of our client. The Goddess of healing dwells in the heavens high, while mankind stays in the world below. In the name of the Founder, may the heavens be reflected in the earth below so that this healing medicine may encircle the world. Previous Post - Previous post: Maha Sadhu to Ven. Sivali!! !